On Friday, 29.11.13, Linda Patrick brought a number of her Victorian and Edwardian Christening Gowns from her collection to Lincoln Bailgate. Early gowns were quite tiny as infants were christened very early in life, often at a week old. Mainly white fine cotton lawn was used although well off families chose silk, which perished over time. 'One-size-fitted-all', with cleverly fitted adjustable draw-string ties at the neck and waist. Minute pin-tuck pleats attached a bodice to the long full skirt. Robing of lace echoed an earlier fashion for an over dress, revealing a richly embroidered underskirt. Fine stitching was worked on the bodice with lace or pin tucking forming a V which matched the inverted V formed by the robing with embroidery on the bodice echoing the design on the skirt. Linda explained how Ayrshire white work embroidery became popular about 1840 and beautifully worked panels for the bodice and front were commissioned for high status robes. As fashions changed, broderie anglaise, lace and pin tucking came in to favour and were hand worked until the introduction of sewing machines in 1880’s. Living and sewing in Lincolnshire, Linda is a christening gown designer who sells bespoke hand embroidered and reproduction gowns, most recently three of her gowns were featured in the BBC series "The Paradise" She also repairs and restores family gowns and has some original gowns for sale. For a more detailed look Linda's website http://www.littledoves.co.uk/ is filled with examples of her christening gowns, rompers and accessories. We all enjoyed a marvellous day together. Using techniques described by Liz we built up our landscapes starting with wisps of fleece and building up to more defined images. It was marvelous to see the various views emerging. Here is Julia about to show us how to spray glue the machined pattern onto the wadding and the backing. We are now returning to the Bailgate Methodist Church Hall for our Friday evening meetings. The new Committee includes Jacqui Armitage as chair, Anne Petch as treasurer, Anne Goodall as secretary and other committee members are Lyn Rochester, Shirley Fuller and Di McCatty. Andrew McDonald brought a quilt which was probably made in the late 19th century and we all had ideas as to how it had been made. The Linus quilts were on show together with others. We will work on pieces roughly 18" square. There is a charge of £5 each for wool. Liz will bring a wide selection of colours. It is very important that everyone has a selection of images to work from. This will enable you to challenge your skills and learn a wider range of techniques. Flowers and landscapes work well but a choice would be good as some images work better than others. Cost of the workshop is £25 for EG members and £30 for non-members. Please bring a packed lunch with you. Tea/Coffee/Biscuits will be available throughout the day. If possible, please can you let her know by Thursday 26th September, so she can let Liz know how many kits will be required. 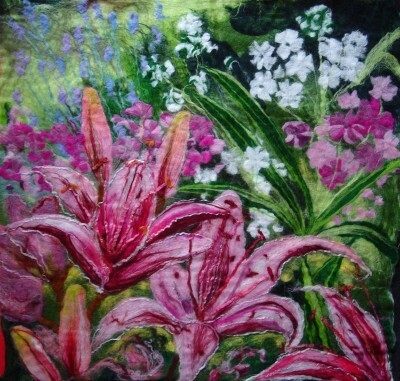 The Embroiderer's Guild travelling collection will be on show Grantham Museum 15th October 2013 to 4th February 2014. 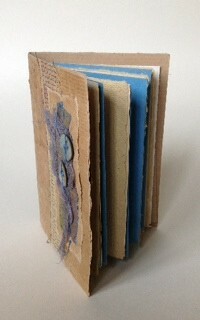 At our final meeting of the season on 26 July, Christine Plummer led a mini-workshop on book-making. She managed to give most of us individual tuition! Unfortunately there was a party in the main hall next door and the noise of that drowned out 'speaking to the group' as Chairman Jacqui discovered when she conducted the meeting! We barely heard her shout to introduce Christine Poole, EG Chairman, who had popped over from Yorkshire to chat with us informally. Some members even managed to make their books in spite of the din! There is a saying "Out-of-chaos-comes-beauty". Congratulations to everyone who persevered. Determination won out. It never ceases to amaze everyone how different the finished products turn out to be when everyone uses similar supplies to work with. Vylene or decovil, approx 7" x 10"
On Friday evening, Kumi told us how she came to "upcycle" worn fabrics into stitched pictures and handbags, almost mosaic-like in their intricacy. Using linen, silk and cotton fabric scraps and kimono cast-offs she combines textures and limits her colour range. Flowers however, appear in her work as they appear in nature, often in brilliant colour! Kumi draws on her natural surroundings for inspiration, be it twig or bloom. And of course she likes to depict birds also. Her pictures and her bags evoke a calmness and a serenity. But Kumi possesses quite a humourous side and she kept us laughing all through Friday evening. Dressing herself in one of her kimonos, providing little anecdotes as she added layer after layer of clothing, we noticed her Doc Martens peeping out! So definitely: "The whole is greater than the sum of its parts!" It was a truly delightful evening. On Saturday Kumi led our workshop making Cylinder Bags. We used Kumi's starched fabric or our own. This was for the bag exterior and for our 'decoration'. We cut, stitched and constructed our bags. We all included flowers in our compositions! Here is one in the process of being created by Vanda. Then we used unstarched fabric for lining the bag and stitched the two together. Magic. And here are finished bags by Shirley R, Mary B and Lyn R.
Janet's paper making was great fun. There were about 10 of us in the big hall with a table each. We had our pre-prepared paper pulp which we watered down in our plastic vats and scooped up with our deckle and mortars and drained a bit before laying it down on j-cloths and soaking up excess with sponges. The paper and j cloths were put to dry but none of us managed to dry our papers before going home so we each took soggy piles to dry at home. Hopefully some of us will bring paper to display at the next meeting. Tutor Janet with deckle, mortar and a paper sheet in the making; plastic vat below. Ann experimenting - 1. pieces caught between two layers and 2. pieces laid on top. Suzie going one step beyond with paper art. At very short notice Lyn Rochester gave us an excellent talk about her teaching needlework to women at Morton Hall Prison. Her teaching was part of the Fine Cell Work project which "is a social enterprise that trains prisoners in paid, skilled, creative needlework to foster hope, discipline and self-esteem." The organisation was officially started in 1997 by Lady Anne Tree following decades of lobbying the Home Office to change the law so prison inmates could learn the skill of needlework and be paid for their work. 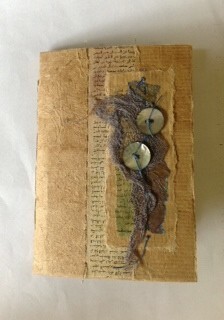 To illustrate her talk Lyn brought samples of completed work plus many photo notebooks of work which has been completed. She also brought correspondence she's received from women she taught. Her talk was an amazing insight into the good which can be achieved by assisting people to learn needlework skills. Lyn's work and that of others, including Carole Biggin, continued until Morton Hall closed in 2011 and the women chose another prison to finish their sentence. Now Lyn promotes the ongoing Fine Cell Work by giving talks to groups and this helps raise awareness. A delightful day was had at Heighington in the Thomas Garrett Heritage Rooms with boxes of wool, homemade cake and inspiration - all from Lyn.